How is it that the systems put in place to help or protect our children are actually failing them? We live in Pennsylvania. Liam was diagnosed on the spectrum six years ago. (In the years following, many diagnoses would follow.) At that time, our state case worker suggested we file for SSDI. We have filed, been denied, appealed, been denied, on and off for those six years. This year when we went into our caseworker to review his benefits we were told to file again. We called the SSI office and asked for paperwork. In the meantime, I get this letter in the mail. Okay, so first of all, what in the heck is the DAP and why in God’s name have I just now been informed of it? We’ve been battling the state for Liam’s rights for SIX years. 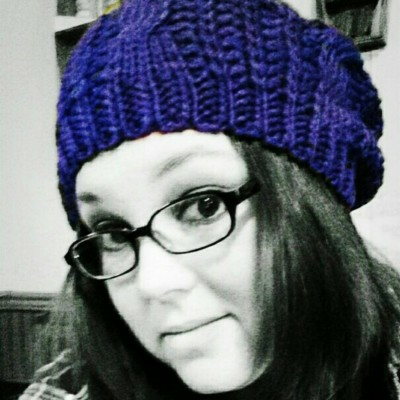 All this time the Disability Advocacy Program of Pa never once stepped in. Not once. Suddenly, here they are, telling me if I DON’T file for him that I AM IN VIOLATION. What about them? 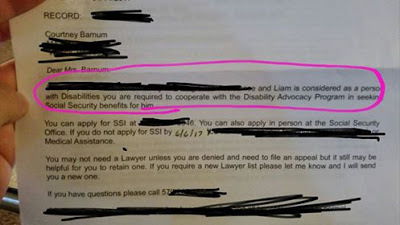 As you can see, they clearly state that “Liam is considered a person with Disabilities.” Yet, year after year, case after case, this very state denies him. Okay. Then why can’t he attend a traditional school? Why are you, the state of Pa, helping to pay for me to not work, in order to care for, and to school him myself? Why does his school have him in numerous therapies for Speech, OT, and PT? How can you deny the fact that NUMEROUS doctors have diagnosed him with so many conditions, three of which automatically qualify him for SSDI? Why is it that systems put in place to help our children aren’t. (Remember, we’ve been filing for six years, and just NOW we’re being told there’s an agency that helps with that.) Yet, the only help they have given is to tell me I could be in violation. Gee, thanks, Pennsylvania! Our children fight so hard to find their place in this world. They fight to overcome their obstacles and to face their challenges. As parents, we help them with these battles. We also try our very best to make sure all of their needs are met. Yet, the systems put in place to help them, don’t. Instead, they fail them, and us as well. What Does the Future Hold for My Son With Aspergers?